We all have our own preferences especially when it comes to the comfort food we grew up with. For instance, some might like their pastas with meat balls and some might like it with ground beef instead. 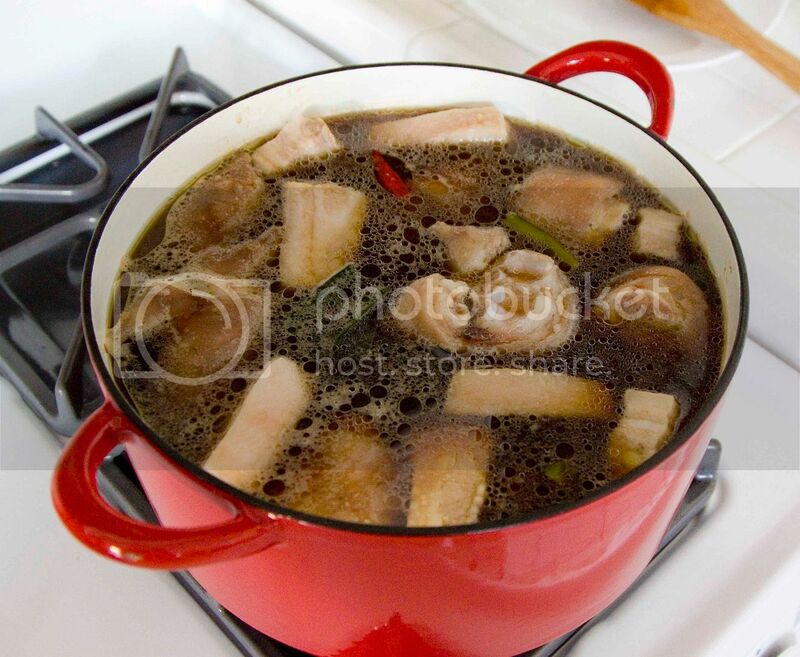 As for pig's feet, some like the skin to be chewy and some like it to be fork chopsticks tender; some like it cooked with soy beans and some like it with heavy soy sauce seasonings. 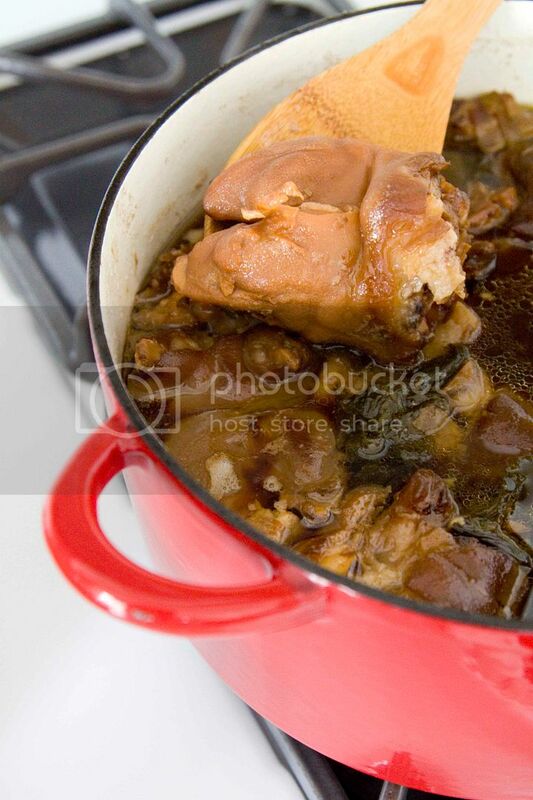 My version gives you semi dark pig's feet with skins fall right off the bones. Ingredients (for a medium/large pot)? I actually mixed some fatty pork with pig's feet. That way people who are not in the mood of chewing between toes can still enjoy this meal. On top of that, I got those pig's feet from Whole Foods since I always doubt the quality of meat from local Chinese grocery stores. At least the ones from Whole Foods were labeled as "vegetarian" with no antibiotics or hormones. 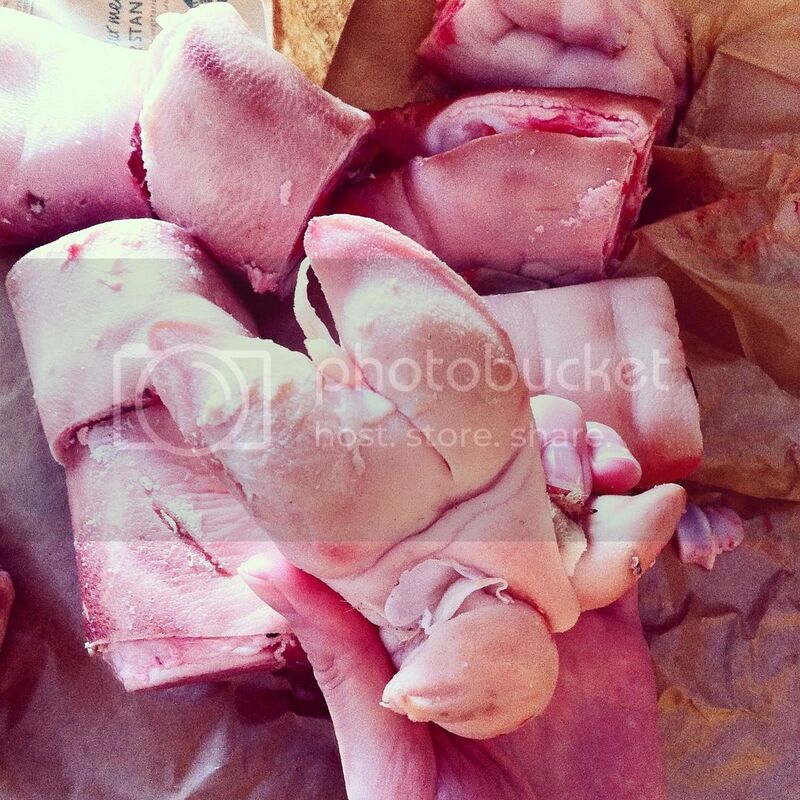 Ask the butcher to cut the feet into large chunks for you. 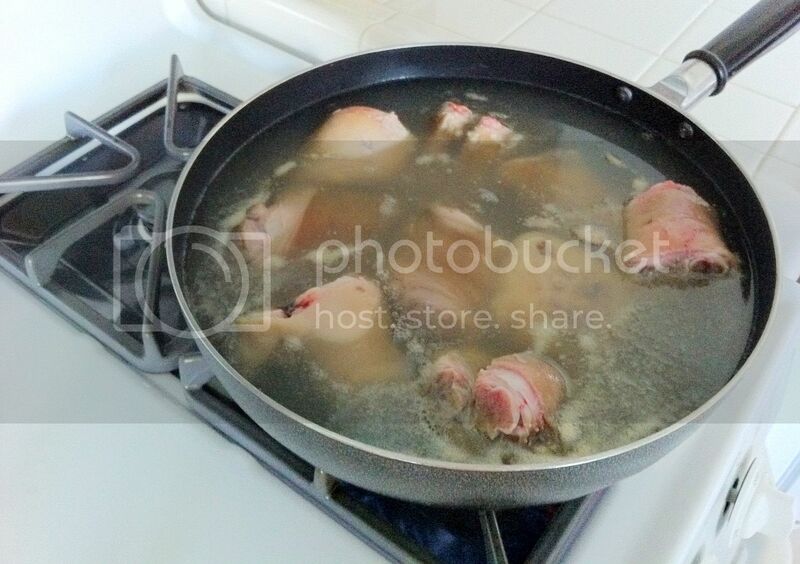 Thoroughly rinse the feet chunks and cut the fatty pork into large and thick slices or chunks. Make sure to pluck out any hair from the feet before cooking. Prepare a big pot of water and carefully add in the meat. Slowly bring to a boil and let it cook for another minute or two to draw out the dirty bits from the meat. Drain well and rinse the meat with water, make sure no more dirty bits are present. 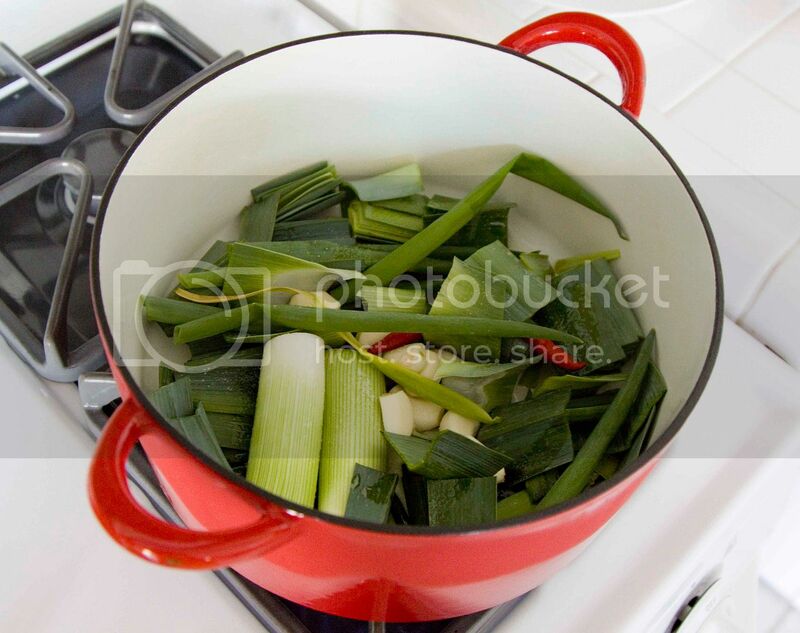 Remove and discard the bottom stems from the leeks. Garlic sprouts are actually preferred for this recipe, unfortunately I couldn't find any at that moment so I used leeks instead. Make sure to rinse every layer of the leeks where sands might be trapped in between. Pat dry and chop into large chunks. 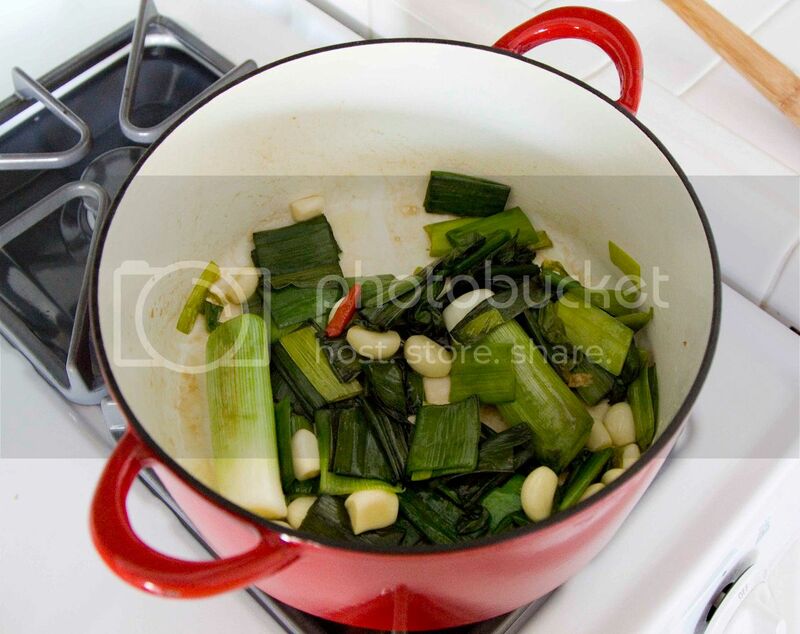 Remove and discard the bottoms stem from the scallion. Remove and discard the stems from the chilies and hit it a few times with the side or back of the knife. This will help releasing the aroma without having the seeds flowing everywhere. Peel the garlic cloves. Take a big pot and drizzle just enough olive oil to evenly coat the bottom. Add in the leeks, scallion, garlic cloves, and chilies along with some sea salt. Sear for few minutes and give it a few stirs in between. Cook until the greens softened. Add in brown sugar and cook till that slightly sweet aroma comes out. Add in all the meat and sear the sides for couple minutes. Pour in the soy sauce, black bean soy sauce, and hot water. Bring to a boil and lower the heat to let it simmer. Remember to skim off any foamy or dirty pieces floating on the surface. Check more often in the first 30 minutes and there should be very little or no more dirty bits throughout the remaining cooking time. Try to have all the ingredients covered under the liquid in the beginning. You might have to turn the meat around once a while towards the end making sure all sides are seasoned evenly. Around 3 to 4 hours, I turned off the heat and let the whole pot cooled down a bit. Covered with lid and into the fridge for 12 hours or overnight. 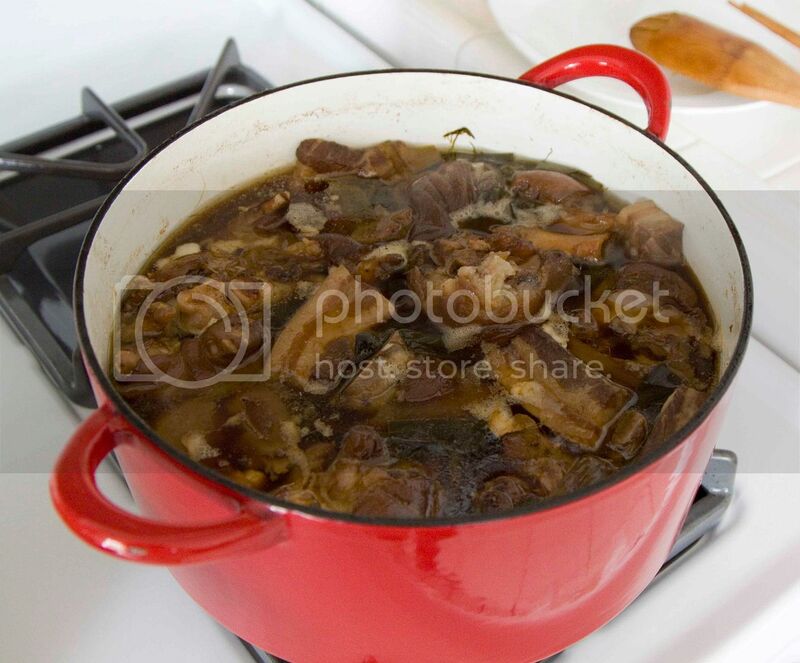 That way you'll have darker and more flavorful stew in the end (like the one showed in the very first picture). Enjoy with steamed white rice! 3 hrs!!! 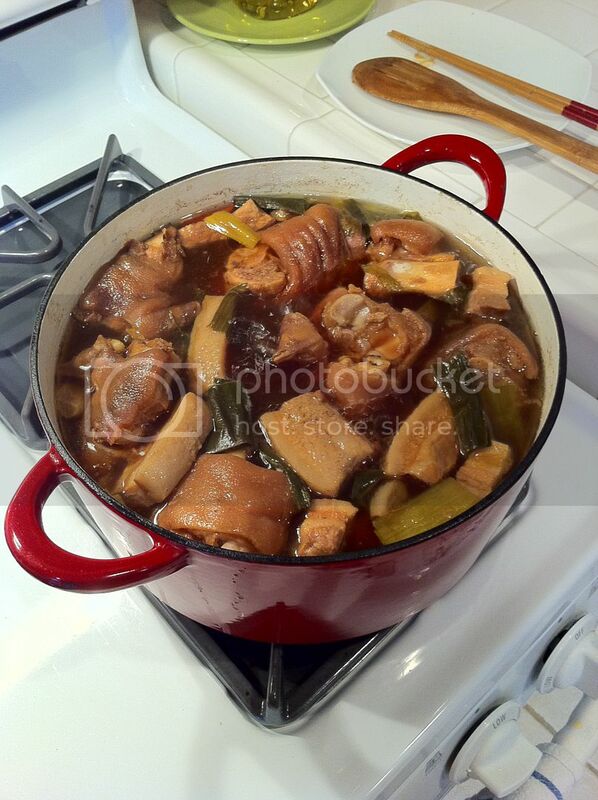 I bet the pig trotters have got all the flavors and essence, and the skin must be cooked to perfect tenderness. Yum! Thank you for the compliments!! (Happy)! Thanks for the invite, I'll go check it out right now! That's a good way to do it. I think the bad smell is from the way they kill the pigs here in the states. Back in Asia (this might be kinda graphic), the butcher will let the blood out till completely drained. That's how the meat can be smelly-free. If you have access to a Japanese market called "Mitsuwa" here in the states, they actually sell very high quality pork with no smell at all!